As opposed to External Beam Radiation, in Brachytherapy, the source of radiation is placed within or adjacent to tumor tissue itself. This process is useful for cervical, breast, esophageal, bronchial, bile duct cancers etc. The HDR Brachytherapy Unit has its own dedicated and computerized 3-D Treatment Planning System and the treatment is delivered in a few minutes. It refers to the use of multiple spatially inhomogeneous energy beams which converge upon a treatment volume in order to create a conformal and spatially homogeneous dose. This is accomplished using so-called inverse planning where the physician defines a set of ideal dose constraints from the standpoint of minimal and maximal allowed doses to the target structure as well as organs at risk. Using this technique, high tumoricidal doses can be delivered to the tumours, with normal tissue sparing, thus increasing the cure rates and improving local control of the disease, which was not possible. before with conventional 2D/3D conformal modalities. Thus it is considered a revolution in the field of Radiation treatment. It is ideally suited for irregular/concave shaped tumors and for tumors surrounding radiosensitive structures. The technique is delivered by the Linear Accelerator machines with Multi Leaf Collimators (MLC), which shape the radiation beam according to the tumour contour. The smaller the leaf width of the MLC, the better the tumour conformality and normal tissue sparing. The Novalis TX has the smallest leaf width of 2.5mm, to ensure the best possible conformality. It is the integration of various radiological and functional imaging techniques in order to perform high-precision radiotherapy. The main aim is to reduce setup margins which could occur during daily positioning, and internal margins occurring due to the patient body’s respiratory or bowel movements, and to account for target volume changes during radiation therapy, such as a tumor volume decrease or weight loss (Adaptive radiotherapy). This is not only an IMRT technique; it enables various radiotherapy techniques, including IMRT, to be delivered more accurately.Therefore, it will allow further dose escalation and/or conformal avoidance than IMRT alone, which will lead to improved treatment outcome. The ExacTrac (R) system that automatically aligns the target volume with the treatment beam based on infrared tracking of external body markers. It also uses automated registration of bony structures and implanted radiopaque markers using stereoscopic X-ray imaging. The Exactrac 6D Couch enables fast and precise couch correction in all directions to account for any misalignment or rotation. For the treatment of tumors that move with respiration, a respiratory gating system, which makes use of implanted markers, is being used. Daily Cone Beam CT, to match the initial treatment planning CT is done to ensure the best precision. Stereotaxy refers to using a precise three-dimensional mapping technique to guide a procedure. Steriotactic Radiotherapy is delivered by several beams that are precisely focused on a three-dimensionally localized target. A special frame or a thermoplastic mask is used for CNS tumors, while a body frame may or may not be used for extracranial sites. If given in more than five fraction ? SRT. 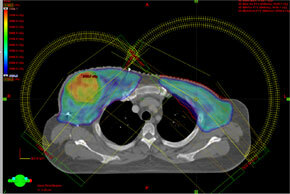 SBRT is a novel cancer treatment strategy .Whereas conventional external beam radiotherapy is typically administered in daily doses, or fractions, in the range of 1.8 to 2.0 Gy to total doses of 60 to 70 Gy or so, with SBRT ultra-high doses per fraction are applied, generally in the range of 10 to 20 Gy per fraction, in an abbreviated, hypofractionated regimen of 5 or fewer fractions. Such high doses per treatment were unthinkable in the past because of limitations in treatment delivery technology that raised concerns about potential toxicity if large volumes of normal tissues were exposed to so much radiation in each treatment. These are now possible with the best anatomical imaging modalities like MRI, and also biological imaging modalities like PET-CT, MR spectroscopy. The technique is suitable for tumors in the Lung, Liver, Pancreas, Spine and Prostate. HDRC is a volumetric intensity-modulated arc therapy, which can deliver the required dose distribution with one or a few arcs. For most treatments, this can be performed within few minutes. During the rotation, the dose rate, micro-MLC setting, and speed of the gantry change simultaneously. It can also be used for SRS/SRT. RapidArc combines high conformity with significantly shorter treatment times, which reduce the risk of patient or tumor movement, is more comfortable for the patient and allows a higher throughput of patients, enabling lesser waiting times for treatment. It consists of a single arc where MLC (max 5 mm/degree and 2.5 cm/s), dose rate (max 600 MU/min), and gantry speed (max 72 s/turn, i.e. ~5 degrees/s) are optimized simultaneously to achieve the desired degree of modulation. Our Novalis-Tx has got the latest RapidArc Technology with the HD (High Definition) micro-MLCs having leaf width of 2.5 mm enabling the best accuracy with the fastest treatment times.